Add digital cinema to your TA-10 Theatre Automation System quickly, efficiently, and without rewiring. 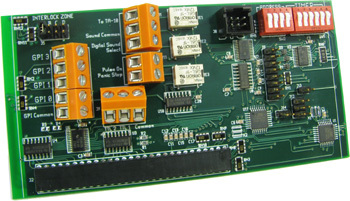 The DX-10 is a replacement MCU board for the TA-10 Theatre Automation. It has an onboard serial port for connection to serial-style digital cinema servers like the Dolby Show Store. It has an onboard GPIO interface for connection to GPIO-style digital cinema servers like the Doremi DCP-2000 and GDC SA-2100. With the DX-10 in place, the TA-10 Theatre Automation responds to digital server commands. The activation of relays, LEDs, remote box signal bus, panic stop, digital sound select, and other automation functions are completely programmable and are controlled by the digital server. It is a powerful system. Cue Manager™ PC software from Component Engineering is used to program the TA-10 to respond to server commands. Programming is fast and easy.